The Ex Scientologist: Did Hubbard Actually Order a Hit? R2-45. It's a very valid technique. A lot of people have used it before now." the process as being "used humorously". humorous contexts. On March 6, 1968, Hubbard issued an internal memo titled "RACKET EXPOSED," in which he denounced twelve people (Peter Goodwin, Jim Stathis, Peter Knight, Mrs. Knight, Nora Goodwin, Ron Frost, Margaret Frost, Nina Collingwood, Freda Gaiman, Frank Manley, Mary Ann Taylor, and George Wateridge) as "Enemies of mankind, the planet and all life," and ordered that "Any Sea Org member contacting any of them is to use Auditing Process R2-45." Former Scientologist Bent Corydon wrote that in late 1967 at Saint Hill, he personally received a copy of an order naming four former Scientologists as enemies and "fair game" and ordering any Sea Org member who encountered them to use R2-45. that the people on the list are to be shot with a .45 caliber firearm. The phrase "Fair Game"
about their scams and criminal behavior. leader. Indeed, they're not allowed to inasmuch as such orders from L. Ron Hubbard are considered dictates from deity and discontinueing such criminal behavior would be cause for ending up on the list for termination. with the Scientology cult may need commentary. Commentary is in red. murder as "suppressive persons" by "Sea Org members" -- a term which will be described shortly. nature and not for distribution. creator suffered from. L. Ron Hubbard had recognized the seriousness of his mental difficulties and had begged for the VA to assist him. Failing to acquire mental help, Hubbard's insanity got worse and his hatred of psychology drives much of the unfortunate occultism and criminal behavior the Scientology cult suffers from today. Every time the crime syndicate's felonies are exposed and followers go to prison, it's the fault of "Psychiatrists" -- capitalized. The phrase "Fair Game" refers to another one of the crime syndicate creator's criminal racketeering orders, official policy which the cult's followers are not allowed to ignore. "Fair Game" in Scientology's cult-speak means, according to Hubbard, that victims of the cult may be lied to, cheated, harassed, and "destroyed utterly" -- with any means possible. 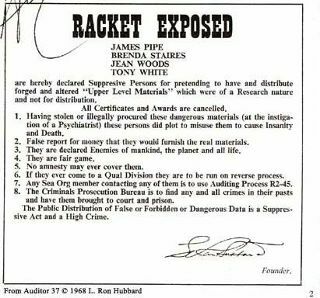 The crime syndicate has been hauled up in front of a large number of judges because of the fact that the policy of "Fair Game" proves rackeeting, conspiracy, harassement, and other pre-meditated behavior. The crime syndicate's cult lawyers have tried to demand that such a policy doesn't exist any more yet the cult continues to provide evidence against itself. Here's the worse whistle-blowing aspect of this piece of evidence. The so-called "Auditing Process R2-45" is Scientology cult-speak for correcting a "suppressive person" with 2 rounds from a .45 caliber firearm. This "ethics order" created by the cult's leader, L. Ron Hubbard, states that any "Sea Org Member" is allowed to murder the people on the ever-growing list of enemies. A "Sea Org Member" is a cult follower who has been suckered into the cult so badly that they're willing to murder for the cult -- as is required according to Hubbard. When L. Ron Hubbard and his ship the Apollo was repeatedly run out of every port in the United States (and many other countries) he declaired his ship to be a "Org" -- which is cult-speak for a franchise. Cult followers sign a billion year contract to join the Sea Org, indicating their devotion to the cult and, presumably, their willingness to fufill such "Ethics Orders" as this one demanding murder. agency." Real religions and real business don't ask such questions. Thanks go to the FBI for its 1970's raids of the Scientology crime syndicate compounds which seized such informative documents as this one.